(CNSNews.com) - Real monthly federal spending topped $400 billion for the first time in June, when the Treasury spent a record $428,894,000,000, according to the Monthly Treasury Statement released today. So far in fiscal 2017 (which began on Oct. 1, 2016 and will end on Sept. 30, 2017), the Treasury has brought in $2,507,820,000,000 in taxes and spent $3,030,903,000,000—running a deficit of $523,082,000,000. Last year in June, the federal government spent $323,320,000,000—or $328,303,590,000 in constant 2017 dollars. The record $428,894,000,000 that the federal government spent this June is $100,590,410,000 more (in constant 2017 dollars) than last June’s spending. 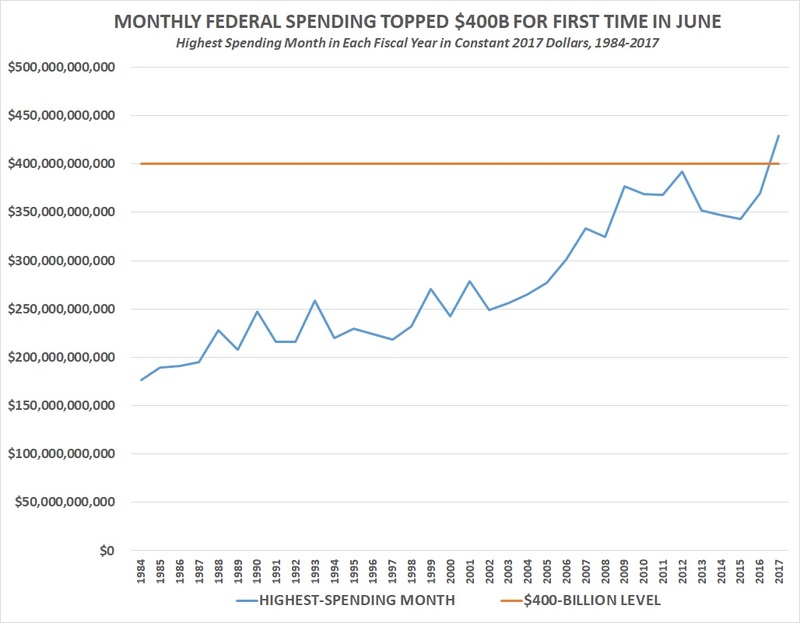 The dramatic increase in spending from last June to this June was driven by increases in spending by the Departments of Education, Housing and Urban Development and Health and Human Services. It was also helped by the fact that the first day of July fell on a Saturday rather than a business day. In June 2016, the Department of Education spent $12,096,000,000 and by that point in fiscal 2016, it had spent $59,457,000,000. This June, the Department of Education spent $45,691,000,000 and so far this fiscal year, it has spent $90,206,000,000. This year’s June Department of Education spending is $33,595,000,000 more than last year’s. In June 2016, the Department of Housing and Urban Development spent $3,294,000,000 and up to that point in fiscal 2016, it had spent $20,169,000,000. This June, Housing and Urban Development spent $24,443,000,000, and so far this fiscal year, it has spent $49,498,000,000. This year’s June Housing and Urban Development spending is $21,149,000,000 more than last year’s. In June 2016, Health and Human Services spent $87,030,000,000 and up to that point in fiscal 2016, it has spent $792,492,000,000. This June, HHS spent $113,925,000,000 and so far this fiscal year it has spent $823,914,000,000. In its own analysis of federal spending for June, the Congressional Budget Office explained the massive increases in Education and HUD spending during the month.